Any old house owner that has removed plaster knows just how, well, miserable it can be. The amount of debris and waste it produces is simply shocking. In terms of demolition, the best case scenario – your plaster is only ⅜” thick. But from experience, I find instead that most plaster and wood lath surfaces are often easily twice as thick – around 3/4″. The most common and flat-out brutish way to go about removing plaster: Whack the wall with the claw of a hammer, work in a long pry bar and have at it. Feeling tough, some might grab a sledge hammer. It’s a great way to take out some frustration and with it, removal seems to go twice as fast. 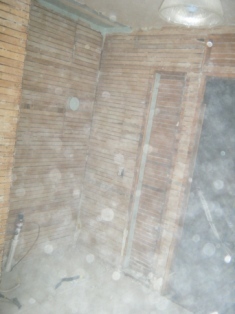 Best practices – you’d set up dust containment and perhaps a means of negative pressure ventilation. At minimum, you could sit a box fan in a window and point it outward. Things get extremely dusty in this process. Beyond that, maybe you’ve considered questions about the lead content in the plaster itself (and its dangers, especially when released in airborne form). Of course, that’s not to mention the paint that has been chosen to cover it through the years. Feeling a little sly, you might grab a shingle remover and pry. In most cases, it doesn’t matter if you just scrape off the plaster and/or yank the lath right off while you’re at it. The plaster crumbles straight down to the ground – creating a heap and a fog. As your pile of crumbled plaster starts to grow, and when it reaches about shin height, you pull out a snow or other shovel. You use it to transfer your pile of deconstructed plaster to a contractor bag. And after you’ve filled your third, you get the idea to just stab at the wall with that shovel. As a helper removes the plaster from the room (boy, those bags are heavy), you finish exposing the framing below. *Now, we’ve all done it – fast and dirty. Well, at least – dirty. And I’m sorry – there is a much better, or at least – a smarter, way. When making a cut out, you are usually cutting into a stud or joist bay, tight to the inside edge of framing. Cut outs are usually required for smallish house modifications, but repeat this operation if you removing more of a surface, like an entire wall. It requires two people (three is actually preferable), and note the resulting waste will be surprisingly heavy! So . . . SAFETY FIRST! Work gloves, a particulate respirator and eye protection are a must. Cut two pieces just short of the length of the desired cut out. We’ll call these pieces cleats. Then cut four pieces just short of the width of the cut out. Furring strips will do just fine for this operation. With a solid point of reference (gained maybe from several pilot/probe holes driven through the plaster), agree upon a means of communication with your helper. The second person, working from the front, holds the shorter cleats at regular intervals across the proposed opening. Working together, screw two 3 1/2 inch screws into each cleat intersection (four screws total per short cleat). These screws go through the outside cleat, through the plaster and the lath, and into the cleat behind. (Trust me – this will not be easy, and there is some risk.) The person working on the back side of the surface will need to be conscious of their hand placement and communication throughout must be effective. Optionally, and employing flat washers, add additional shorter screws on diagonals and around the perimeter of your cut out. These grab not the cleats but the only lath. Further, and to ensure that the plaster that is to remain, remains intact – set a handful of washered screws off the edge around this perimeter as well. With these washered screws, attempt to sink them into framing. Note: We are going only for a rough cut, but with a little more precision, you could have made a full-blown jig for the cut out. We could build a full “ladder” – placing additional cleats on the front side, and still offsetting those on the backside. Use this then as a guide for the fence on your sawzall as you execute the cut. Drill starter holes, approximately 1 ¼”, just inside each corner of the planned cut out. Optionally, take a sturdy rope, a 16-foot length (or longer), and attach it the back side of the assembly in some manner. Attach it at two points. Then, take the free end (the middle) of the rope and, if feasible, tie it off somewhere. Leave two to three feet of slack. Along the cut line, score with a utility knife first and make your cut with a reciprocating, or a mess-making circular, saw. Use a discardable bi-metal blade. Important! At each corner, stop about two inches short of connecting the cuts. Have the person on the backside of the plaster come around to the front side. Give each uncut corner a couple of firm whacks with the hammer. Complete cuts by hand with a jab saw. Pry the lath away from the framing, supporting the plaster section. The helper quickly returns to their original location and unties the rope. They then use the rope to help lower the slab of now freed plaster and lath to the ground. The person on the outside of the cut, spots and guides the cut out. In doing this, and while it may seem excessive to some – you will keep the plaster and lath coupled – greatly minimizing dust and debris. It also makes the clean up process more efficient and less back breaking. You do need to be conscious of existing framing members (if they are to be saved). But it simply sets you up nicely to return later to complete whatever larger job you’ve intended – installing plumbing, installing a door, removing the wall, etc. Now if you are in fact removing an entire wall, just repeat. While it my seem slow at times, I think in the end you’ll find – it’s, at minimum, a wash and your job site remains more, well, orderly. But what if I don’t have access to the back of the plaster … dude? A similar technique can be transcribed to fully finished walls. Using some probing (with the claw of that hammer) locate studs. Take a ⅜” sheet of plywood (or OSB) and cut it to a reasonable size. I’ll say no more than 4×4 (again – the resulting waste will be heavy), but an odd size might work just as well. It can either be the exact size or just smaller than your planned cut. Using washers, screw the plywood to the face of the wall. This screw pattern does not have to be exacting or even pretty. Screws just need to sufficiently grab lath. (Understanding how plaster walls are constructed can help greatly at this point.) An 8” screw spacing, in this case, will likely work very well. 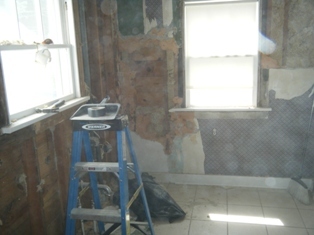 Editor’s Note: For more on how plaster and wood lath walls are constructed, please see my article for The Home Depot‘s Pro Referral Network – How to Repair Plaster Walls. Then working from the top of the wall down, execute your cut outs, strategically placing them in relation to framing. Still with two people, catch the plaster sections as you remove them. Heck, in this configuration, you could even add handles to your ply – this make grabbing, carrying, and removal in general much easier on larger jobs. Reuse your cleats, jigs and/or ply as you see fit. I have only spoken briefly about my last, last house – a 1920s cedar-shaked Colonial. It was a large hulking structure on a street filled with duplexes, I-houses, and bungalows. And that’s exactly what my neighbor, we’ll call him – Tom, had – a bungalow. Tom and I are actually quite different. He is full-on craft brew, while I’m, you know – more Miller Lite. A smart, gritty, street-savvy entrepreneur, the owner of a local coffee establishment. He is in all ways representative of the DIY super-culture that exists here in Baltimore. Tom didn’t call me over for my expertise that weekend; he had the matter well in hand. That day, he needed, well, another hand. He had been working on installing pull down attic stairs. Like many bungalow owners with growing families, he was concerned about, and trying to access an underutilized portion of his house. With stairs, he’d be able to use a small bit of his third floor for storage. That day, he made some cuts and a smallish section of the ceiling (approx. 2 x 3) was removed almost perfectly to plan. I did my part; I eased the cut out, extending from the existing attic access, down to the covered floor. When it was all done, it was heavy, hoppy micro-brew Time! So as Tom and I hung for a bit, talking over a beer, I told him about my time working for a general contractor. He told me that his dad was a sheet metal contractor. We laughed about my first experience with demoing plaster – just as it was detailed above. He told me he worked for a bit in set construction on stage crews. Let’s be fair, too, and I will show my age, and expertise, I probably have as much experience with pneumatic tools as I do with a hammer. But I still know what one is. The first known iteration of an impact tool; it is used to drive things, like nails. Does it take skill and focus to wield a hammer? Further, the hammer is a symbol of the worker, of the god, of the warrior, of the carpenter. Question: Why don’t hardware stores or home centers give you a place for a good test drive of their hammers. A table where you could, I don’t know, bang some nails? …Liability? Picking and using a hammer is all about feel. Sure, it’s OK to look for features, and to take your time when selecting. But hammers even in the same lines seem to be slightly different one to the next. Creating a feature wall is a great way to add a little extra zing to a room. With wallpaper, you'll also find an easy way to hide minor imperfections in plaster walls. 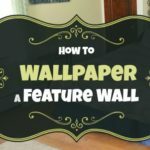 Read on to Learn everything you need to know about hanging vinyl wallpaper on a feature wall. absolutely . . . hers and his! thanks for chiming in susan #ff shout soon @homedigz. thanks for hosting.